Sony has reintroduced Aibo, its robotic dog, to the U.S. market. (Courtesy of Sony). Sony's reintroducing the Aibo dog to the U.S. market as part of an effort to revitalize its brand. But over the past decade, it’s struggled to adapt to changing trends in the electronics world, and watched its prominence evaporate in nearly everything from televisions to smartphones. Now, Sony is looking to reclaim some of its reputation for excellent design and innovation. On Thursday the company revealed that it’s relaunching Aibo, its iconic robotic puppy dog, for the U.S. market. The company introduced the first of its Aibo pets in 1999, releasing several models before discontinuing them in 2006. 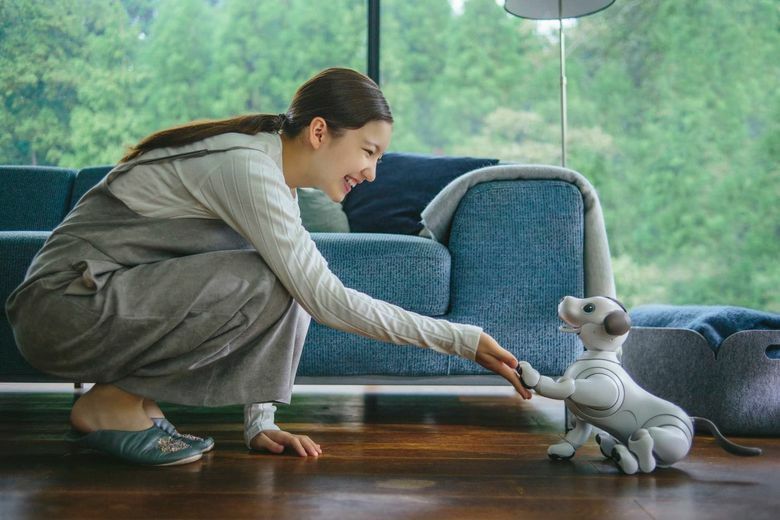 The new smartphone-connected model of Aibo not only revives a classic product but acts as an ambassador of the Sony brand for a new generation of Americans. “It is an interesting reflection of Sony trying to rediscover itself,” Bob O’Donnell, analyst at TECHnalysis said. With a $2,900 price tag, the puppy isn’t meant to be a must-have toy for every house. The true point of Aibo is to remind Americans about Sony’s capabilities, and set the stage for more to come from the company in the fields of artificial intelligence, robotics and quality consumer electronics. The name Aibo is a play on the phrase “artificial intelligence robot” – it’s also the Japanese word for a pal – and proving its prowess in AI is more important to Sony now than it has ever been. The company first released the new Aibo with a major ceremony in which it presented the dogs to owners selected by lottery. To date, it’s sold 20,000 units in Japan. It expects to sell fewer than that in the U.S., said Mike Fasulo, Sony president and chief operating officer. Aibo is also an attempt to show that Sony’s learned from its past mistakes, as it failed to place more importance on the marriage of software, services and hardware. Like many Asian conglomerates, Sony kept its many divisions siloed off from each other. Analysts often note that while Sony owns both a major movie studio and a major music label, it failed to pull all of that together to match Apple’s iPod. It also completely missed the mobile revolution, ultimately exiting the U.S. smartphone market. The firm has also been criticized for making beautiful products with kludgy software, a sin in a consumer electronics era that values the marriage of both. Under the leadership of Kazuo Hirai, who resigned as chief executive in February, Sony clawed its way back to profitability. Hirai set a vision for Sony to knock down barriers between divisions, and create products that connect with people on an emotional level. That work’s expected to continue now that Kenichiro Yoshida is Sony’s new chief executive. Along the way, the two have cut some iconic businesses such as Sony’s Vaio laptops. Much of its focus, O’Donnell said, has moved behind the scenes to make image sensors for other firms such as Apple. Apart from the Playstation, its products haven’t recaptured the love of U.S. consumers. The hope is that Aibo can reinspire some of the affection, by using AI to become a personal companion. The robodog has over 400 parts, meaning it can move more like a real animal. Its eyes are Sony displays, so its gaze can follow you around the room. Tapping its knowledge of entertainment, Sony’s also made it possible to teach the dog tricks – Aibo can imitate gestures and reproduce them on command later. Aibo can also take pictures with a voice prompt, responding to its owner’s voice. “We’re very much focused and committed to AI and robotics, and the combination of the two. We see a whole lot of applications,” Fasulo said, adding that Sony sees a robotics market beyond Aibo for robots in the business world. But Aibo is a good proof of concept for Sony, O’Donnell said, particularly as more companies expand their robotics efforts beyond utilitarian devices such as robot vacuum cleaners and into robots that can also act as companions. Again, Sony has many of the components to succeed – including advanced hardware, a deep knowledge of entertainment and a reputation for good design – if it can combine them.